Want to run your own Community Project? Why did Iver get involved?What are Iver's aims? The parish of Iver is situated in the Colne Valley Park, in the south-east corner of Buckinghamshire. 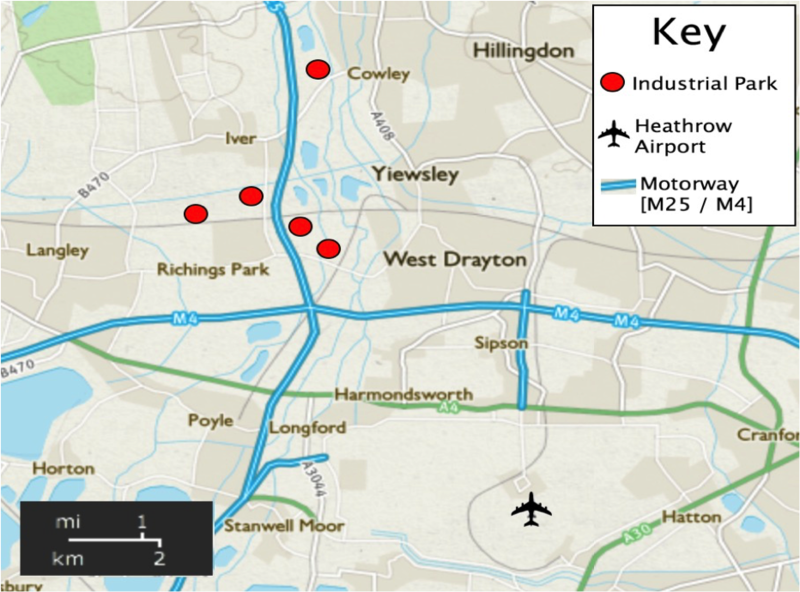 Iver sits close to the M4 and M25 interchange, which is the busiest part of road in Europe. Due to the proximity of Heathrow, London’s busiest airport and the interchange the area has become attractive to freight and haulage companies. There are currently 4-5 unregulated industrial estates and 147 HGV operators. Why did Iver get involved? 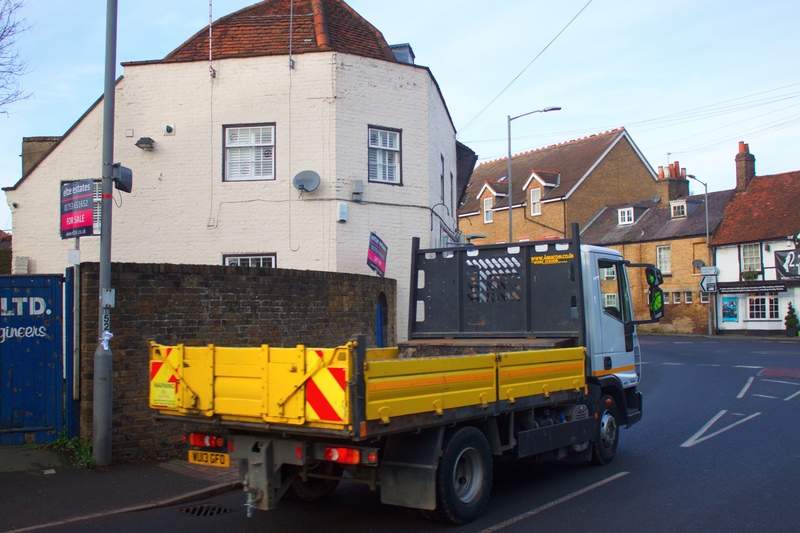 The 147 HGV operators in the area put 969 HGV’s & 353 trailers on Iver’s unclassified roads on a daily basis. The traffic flow data that we have is not fully representative of our HGV problem as the traffic flows are only recorded for 5 days per week (7am-7pm), when in fact the HGV’s operate on a 24 hour basis 7 days per week. Constant threat of more to be developed of industrial estate. Recently Buckinghamshire county council have granted planning permission to Stobart Biomass to build a facility for wood chip storage. This would put an extra 75 HGV’s on our already heavily congested roads. With the high traffic flows through all areas, and the constant threat of further industrial development, the residents are becoming concerned about the potential impacts on their health. In order to stop further planning the residents need concrete evidence of raised air pollution levels to present to the local council. More importantly we believe the residents have a right to know the standard of the air they are breathing by making air pollution visible. 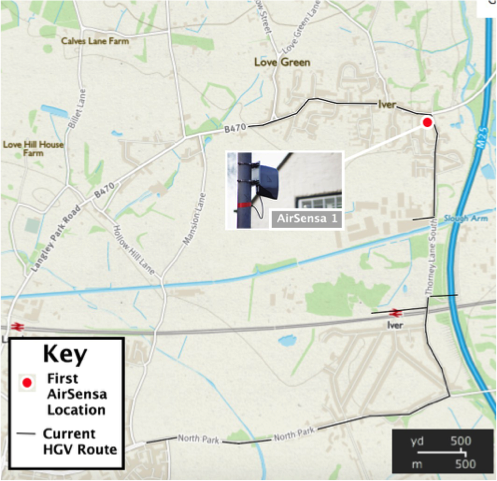 As stated previously, Iver has a close proximity to motorways, the airport, the railway and other industrial facilities. Therefore Iver faces a lot of noise problems on a daily basis. Currently Heathrow airport are trailing new corridors for take off and landing which means the planes are closer to us. We believe it is the start up noise of the airplanes on the stands in the early mornings, which wakes up many residents. Heathrow are denying this accusation and so we are hoping to prove the source of the noise from the AirSensa. We also have the construction of Cross rail taking place, this makes a lot of noise during the evenings when people are trying to sleep especially to the houses which are in close proximity. The motorway is being transformed into a smart motorway, this will widen the road and bring traffic closer to us. Our main aim is to make air pollution visible in our community, we would like a minimum of three AirSensa’s to make this possible. 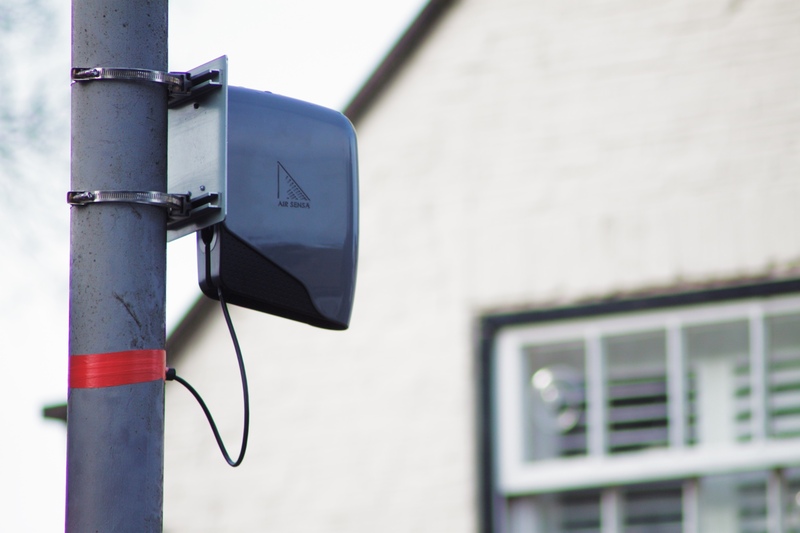 With the use of these sensors we hope will have a sufficient amount of data to educate the residents and use against further planning applications. Many residents are unaware of the health implications to raised emissions, and with some currently suffering we want to change this to allow for them to make the right decisions i.e. whether to walk down the high street at rush hour etc. Through educating and stopping further planning applications we hope to lower the emissions to a safer level and also improve the quality of life of the residents as: “currently its not like living in a village but more an industrial estate” – Quote from a Local Resident. 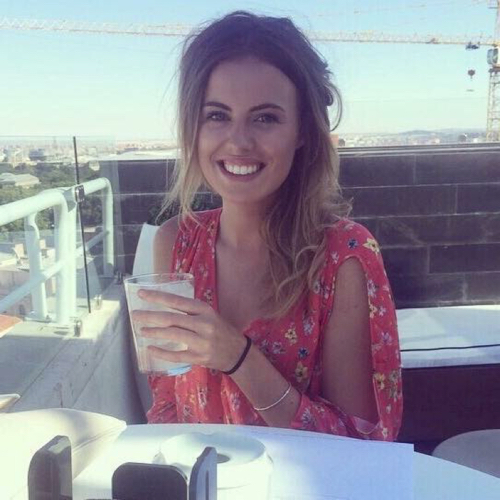 I am 22 years old and have recently graduated from the University of Portsmouth where I studied Environmental Science for 3 years. From a young age I have been interested in the Environment from a conservation perspective as well as water and air quality. Throughout University I focused my degree around water quality, integrating it into my dissertation where I looked at the macro invertebrate distribution in correlation to the water chemistry parameters such as nitrates, dissolved oxygen etc. I have chosen to volunteer for this role to gain more experience and help with the community based project because I believe it is very important for the residents around Iver to understand the issues regarding pollution in the area. With air pollution being one of the key topics in the news currently has made it all the more important for us to get on board. 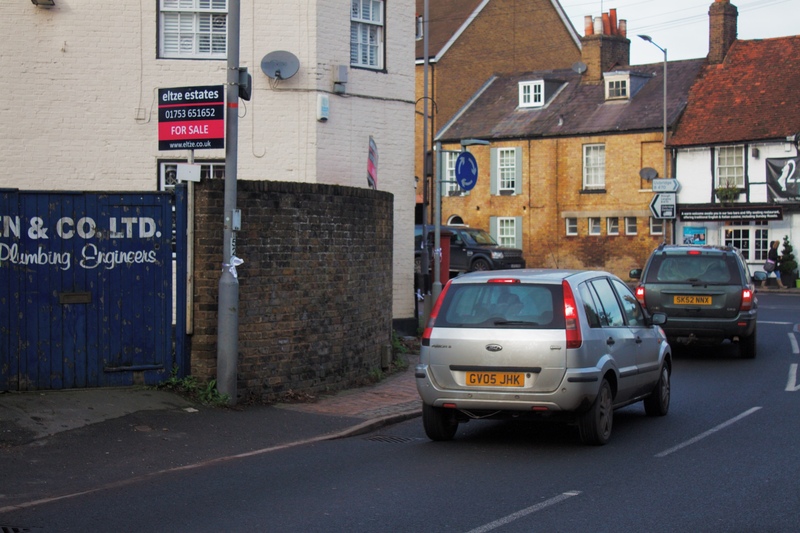 Currently the parish of Iver has one AirSensa that is located on the corner of St Peters Church on Iver high street. This is a busy thoroughfare for HGV’s making their way either back to base or to the M4, M25 or M40 motorways. We are looking to raise funding for a minimum of two further sensors which will be placed in Richings Park and Iver Heath to validate our case against further industrial development of the area.